Following up on his bestselling diet plan, VB6, the incomparable Mark Bittman delivers a full cookbook of recipes designed to help you eat vegan every day before 6:00 p.m.--and deliciously all of the time. 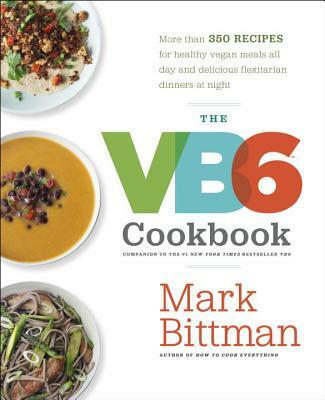 Whether you call it flexitarian, part-time veganism, or vegetable-centric, the plant-based, real-food approach to eating introduced in Bittman's New York Times bestselling book VB6 has helped countless people regain their good health, control their weight, and forge a smarter, more ethical relationship with food. VB6 does away with the hard and fast rules, the calorie-counting, and the portion control of conventional diets; it's a regimen that is designed to be easy toa dopt and stick to for a lifetime. When Bittman committed to a vegan before 6:00 pm diet, he quickly realized that everything about it became easier if he cooked his own meals at home. In The VB6 Cookbook he makes this proposition more convenient than you could imagine. Drawing on a varied and enticing pantry of vegan staples strategically punctuated with "treat" foods (including meat and other animal products), he has created a versatile repertoire of recipes that makes following his plan simple, satisfying, and sustainable. Breakfasts, the most challenging meal of the day for some vegans, are well represented here, with a full range of hot cereals, whirl-and-go-dairy free smoothies, toast toppers, and brunch-worthy entrees. Lunches include hearty soupls, sandwiches, beans, grains, and pastas to pack along wherever the day takes you, and more than a dozen snack recipes provide the perfect afternoon pick-me-up to banish the vending-machine cravings that can undo a day of eating well. Dinners are flexitarian, focusing on vegetable-forward meals that are augmented by a range of animal products for fullest flavor, satisfaction, and nutrient density. A chapter devoted entirely to "building blocks"--make-ahead components you mix and match--ensures that a flavorful and healthy meal is never more than a few minutes away. If you've thought of trying a vegan diet but worry it's too monotonous or unfamiliar, or simply don't want to give up foods you love to eat, Bittman's vegan and flexitarian recipes will help you cook your way to a new, varied and quite simply better way of eating you can really commit to...for life.